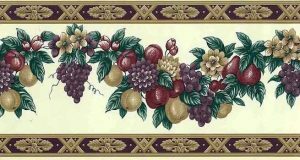 Plums vintage wallpaper border featuring Purple plums and Green leaves with Taupe accents on a Green vine. The plums and leaves look very realistic and the shadow of the Taupe leaves adds further interest. There are broad bands of Purple and narrow bands of Green and Cream at the top and bottom edges of the border. Cottage style. Ideal for a Kitchen.